Five years after initiating collaborations with Massey University, Syracuse University has signed a memorandum of understanding with its New Zealand counterpart. College of Creative Arts Vice Chancellor Professor Claire Robinson, Vice Chancellor Steve Maharey, U.S. Ambassador Mark Gilbert, Professor Kendall Phillips from Syracuse University and Professor Kingsley Baird from Massey’s School of Art, from left, celebrate the signing of the memorandum of understanding between Massey and Syracuse. The memorandum formalizes the importance of the fine arts and design links between the two universities and outlines potential future cooperation. Kendall Phillips, a professor of communication and rhetorical studies and associate dean of global academic programs and initiatives in the College of Visual and Performing Arts (VPA), signed the agreement with Massey Vice Chancellor Steve Maharey in Wellington. 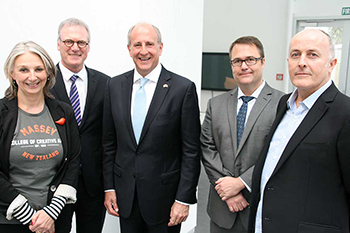 The signing was attended by Mark Gilbert, U.S. ambassador to New Zealand and Samoa; James Fathers, the Iris Magidson Endowed Chair of Design Leadership in VPA’s School of Design; and invited guests. Since 2010, SU has enjoyed a flourishing research relationship with Massey’s College of Creative Arts that has included jointly organizing a conference on contained memory in Wellington in 2010, symposia in 2013 and 2014, interactive Skype events and faculty visits. Massey School of Art and School of Design Professors Kingsley Baird, Ross Hemera and Sally Morgan visited the SU campus last year. Earlier in September, Massey hosted a visit by Phillips for the Triggering Memory Symposium, where he also delivered a keynote public lecture. Baird, Morgan and Phillips are part of the Memory Waka, a research group aimed at building a memory research and teaching partnership between Massey and Syracuse, as well as York St John University in England.